A Timeless Treasure and Style Classic, our rings are always fit for any occasion. 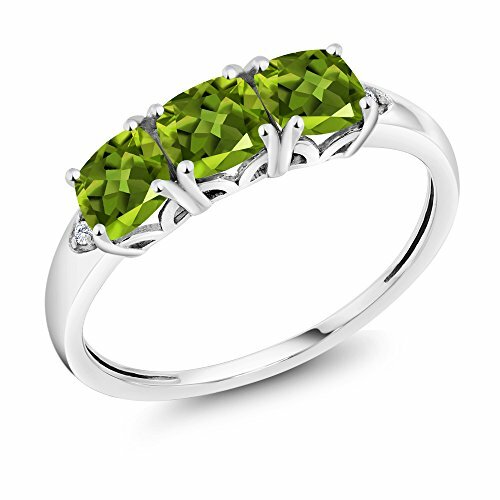 Beautifully crafted and designed our Peridot ring is sure to win your way into her heart. This ring crafted in 925 Sterling Silver that adds a polished look to any ensemble and outfit. This ring is the perfect ring for engagements, weddings and all other occasions. As always with all of our products this item comes in packaging making it ready for gifting as soon as it is received.This beautiful item is brand new and comes with complimentary gift packaging appropriately selected to match the item you purchased. The packaging ranges from dainty foam insert packaging to luxurious leather insert cherry wood boxes. Every order is fully insured regardless of value. This insurance protects you against damage or the loss of your item while in transit. The Shipping and Handling fees include the insurance so there is no need to pay separately for insurance. A Timeless Treasure and Style Classic, our rings are always fit for any occasion. 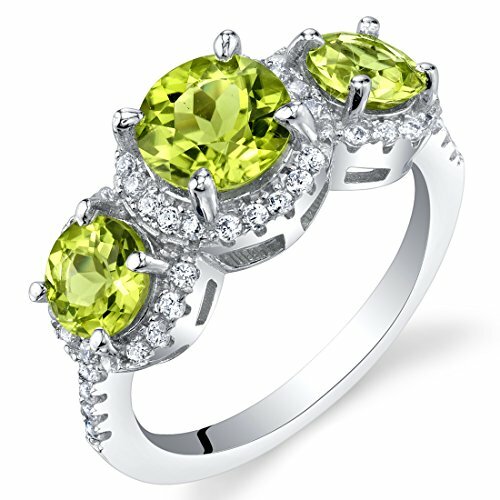 Beautifully crafted and designed our Peridot and Diamond ring is sure to win your way into her heart. This ring crafted in 925 Sterling Silver that adds a polished look to any ensemble and outfit. This ring is the perfect ring for engagements, weddings and all other occasions. As always with all of our products this item comes in packaging making it ready for gifting as soon as it is received.This beautiful item is brand new and comes with complimentary gift packaging appropriately selected to match the item you purchased. The packaging ranges from dainty foam insert packaging to luxurious leather insert cherry wood boxes. Every order is fully insured regardless of value. This insurance protects you against damage or the loss of your item while in transit. The Shipping and Handling fees include the insurance so there is no need to pay separately for insurance. A Timeless Treasure and Style Classic, our rings are always fit for any occasion. 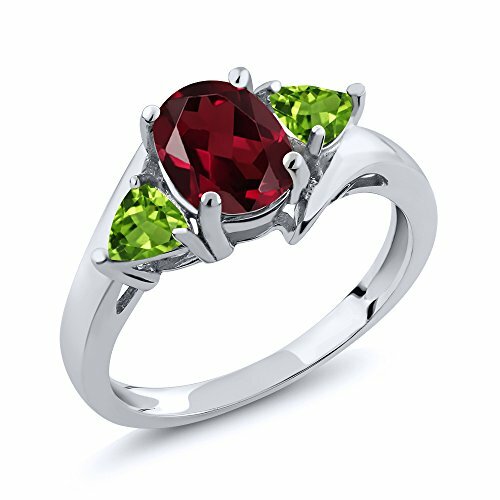 Beautifully crafted and designed our Peridot and Created Ruby ring is sure to win your way into her heart. This ring crafted in 925 Sterling Silver that adds a polished look to any ensemble and outfit. This ring is the perfect ring for engagements, weddings and all other occasions. As always with all of our products this item comes in packaging making it ready for gifting as soon as it is received.This beautiful item is brand new and comes with complimentary gift packaging appropriately selected to match the item you purchased. The packaging ranges from dainty foam insert packaging to luxurious leather insert cherry wood boxes. Every order is fully insured regardless of value. This insurance protects you against damage or the loss of your item while in transit. The Shipping and Handling fees include the insurance so there is no need to pay separately for insurance. A Timeless Treasure and Style Classic, our rings are always fit for any occasion. 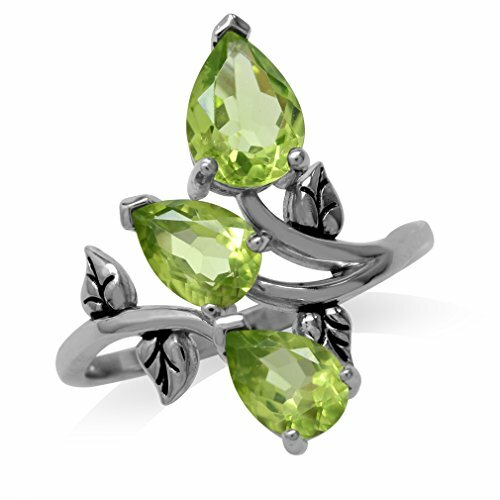 Beautifully crafted and designed our Peridot ring is sure to win your way into her heart. This ring crafted in 925 Yellow Gold Plated Silver that adds a polished look to any ensemble and outfit. This ring is the perfect ring for engagements, weddings and all other occasions. As always with all of our products this item comes in packaging making it ready for gifting as soon as it is received.This beautiful item is brand new and comes with complimentary gift packaging appropriately selected to match the item you purchased. The packaging ranges from dainty foam insert packaging to luxurious leather insert cherry wood boxes. Every order is fully insured regardless of value. This insurance protects you against damage or the loss of your item while in transit. The Shipping and Handling fees include the insurance so there is no need to pay separately for insurance. What a great way to honor your love! 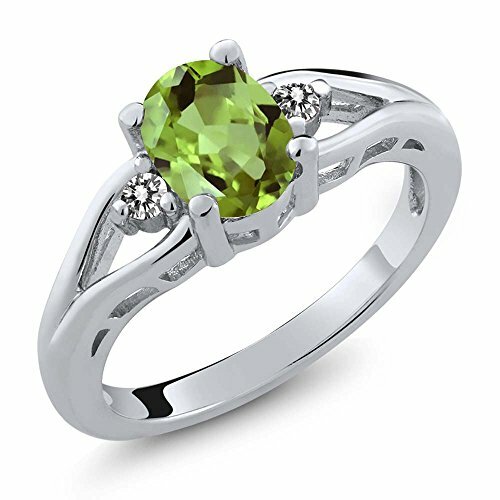 This ring features three cool olive green stones ? perhaps representing today, tomorrow and forever. 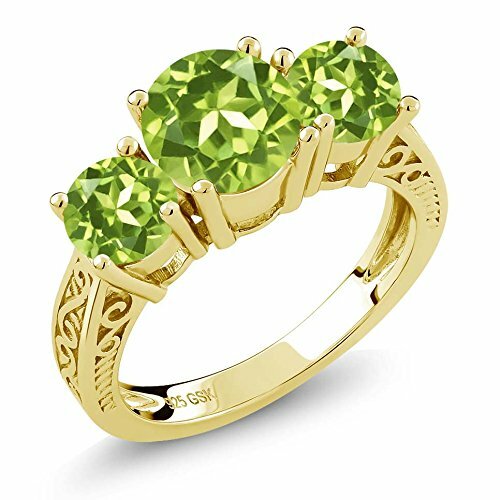 Each genuine Peridot gemstone is wrapped in a halo of icy white Cubic Zirconia Cubic Zirconia accents that extend down the single shanks. Gorgeous handcut facets add lots of texture and character. Conflict-free, ethically sourced genuine gemstones only. Attractively boxed for easy gift giving. 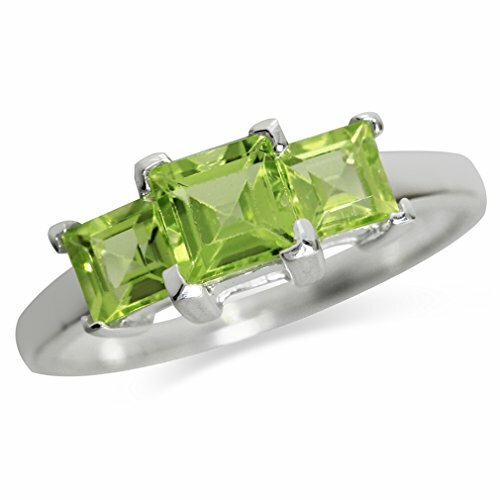 Sterling Silver Peridot 3 Stone Ring (2.30 CT). 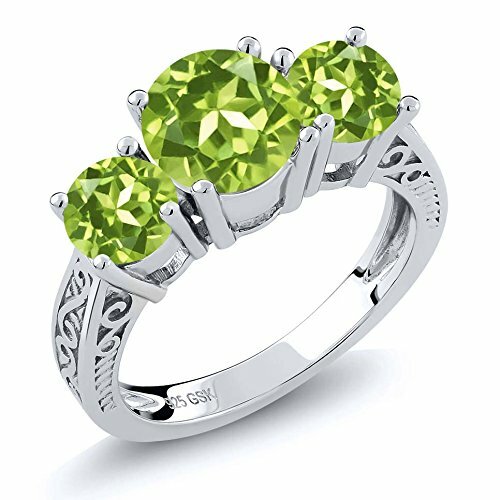 The Peridot stones are Heat Treated. A Timeless Treasure and Style Classic, our rings are always fit for any occasion. 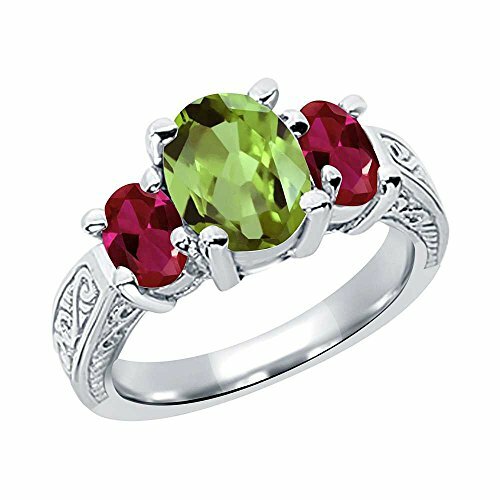 Beautifully crafted and designed our Rhodolite Garnet and Peridot ring is sure to win your way into her heart. This ring crafted in 925 Sterling Silver that adds a polished look to any ensemble and outfit. This ring is the perfect ring for engagements, weddings and all other occasions. As always with all of our products this item comes in packaging making it ready for gifting as soon as it is received.This beautiful item is brand new and comes with complimentary gift packaging appropriately selected to match the item you purchased. The packaging ranges from dainty foam insert packaging to luxurious leather insert cherry wood boxes. Every order is fully insured regardless of value. This insurance protects you against damage or the loss of your item while in transit. The Shipping and Handling fees include the insurance so there is no need to pay separately for insurance. 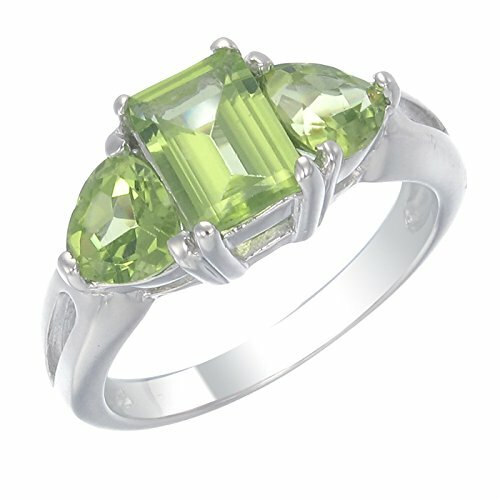 Compare prices on Cut Peridot 3 Stone Ring at ShopPlanetUp.com – use promo codes and coupons for best offers and deals. We work hard to get you amazing deals and collect all available offers online and represent it in one place for the customers. Now our visitors can leverage benefits of big brands and heavy discounts available for that day and for famous brands.